Suppose you are shipwrecked on the Skeleton Coast of Namibia or you are a survivor of an aircraft crash in the middle of the Sahara Desert; how would you tell the time? Simple; look at your watch, you might say; all well and good if you have a watch which is in working order but the chances are that watches and other time pieces would be damaged in shipwreck and air crash situations. Even if they weren’t damaged, they would most probably be set to the standard time of the aircraft’s departure point or the zone time kept by the shipwrecked vessel whereas what we are interested in is the time at our actual position on the Earth’s surface. You might also say “why do I need to know the time? All I am interested in is whether it is night or day. Well suppose for example, you want to hunt for food or look for help; you will want to know how long you have got till sunset so that you can plan your trip to get back to camp before it gets dark. One way of keeping track of time is to make a sundial. To do this, we need no equipment other than a few sticks and stones. At this point it might be useful to consider what we mean by time. Those who would like to do this, may find this link useful: The Sun as a Time-Keeper. Making the Survival Sundial. To be able to construct the survival sundial you will need a rough idea of the latitude of your position. Obviously, this will be difficult in a survival situation but only an approximate figure is necessary. For example, returning to the scenario given above, if you are in the Sahara Desert, your latitude will be in the region of 25o north and if you are somewhere in the Namibia Desert, it will be around 22o south. If we place a stick vertically in the ground, the Sun will cast a shadow from the base of the stick. 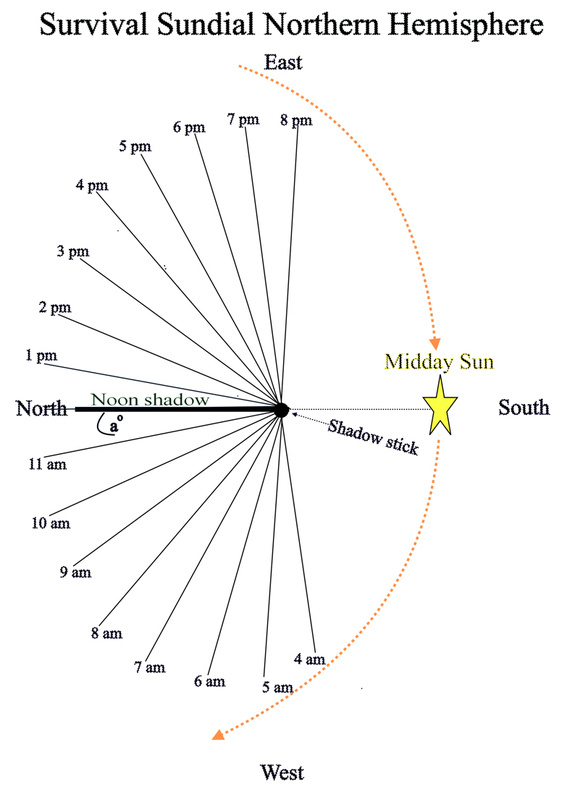 At local noon, when the sun is at its highest point in the sky, the shadow will run from north to south (i.e. along the meridian of longitude running through our position). Place a stone at the other end of this shadow and mark out the line between the stone and the stick. This will be the noon line. Next, tilt the stick, in the direction of the shadow so that the angle between the ground and the stick is equal to the approximate latitude in degrees. The next task is to mark out lines either side of the noon line to indicate the number of hours before or after noon. To accurately calculate the angle between adjacent hour lines involves trigonometry but it is highly unlikely that you will have a scientific calculator or a set of trigonometry tables in a survival situation; so what we need is a rough ‘rule of thumb’ method. (The formula for accurately calculating the angle is explained at the bottom of the page). ‘The rule of thumb’ method is that the angle between adjacent hour lines (ao in the diagrams below) will be equal to one quarter of the value of your latitude in degrees. Next, mark out lines either side of the noon line at the angle calculated above and mark the ends of these lines with stones. When the Sun’s shadow coincides with either of these lines, the local time will be 1 hour either before or after noon. Continue in this way until you have 8 lines either side of the noon line. 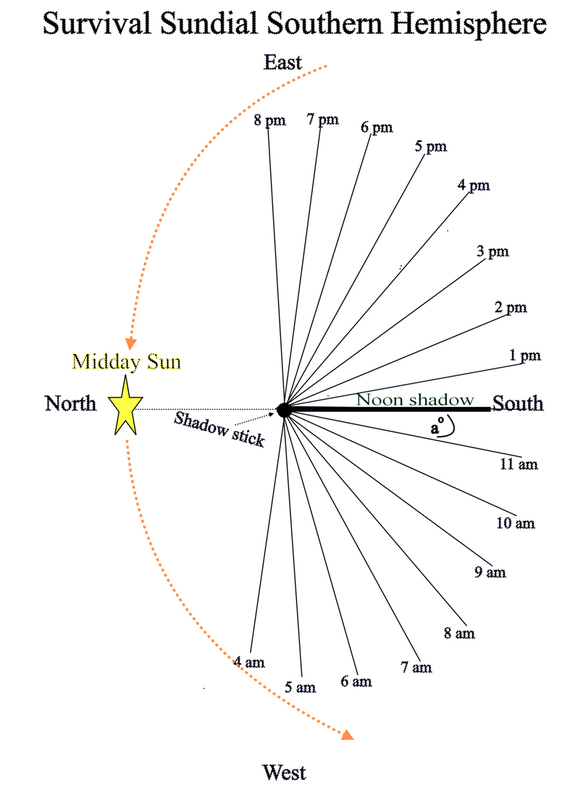 If, in the morning, the Sun’s shadow coincides with the eighth line to the west of the noon line then the local time will obviously be 8 hours before noon (i.e. 4a.m.) and when it coincides with the third line to the east of the noonline, it will be 3p.m. The first diagram below illustrates a sundial for latitudes north of 23.5o north. At latitudes south of 23.5o south, the direction of the Sun at noon will be north instead of south and so the layout of the sundial will be a mirror image of the first diagram (as shown in the second diagram). In the tropics, i.e. at latitudes between 23.5o north (the Tropic of Cancer) and 23.5o south (the Tropic of Capricorn) the direction of the Sun at noon will sometimes be north and sometimes it will be south. This will depend on the declination of the Sun as well as the latitude of the observer (click here to see the Survival Declination Table). For example, on 12th. May, declination is 18.0o north, so at latitude 5.1o north, the direction of the Sun will be due north at noon and the noon shadow will be due south from the stick. However, on 7th. November at the same latitude, declination will be 11.1o south and so the direction of the Sun at noon will be due south and the noon shadow will be due north. If the direction of the Sun is south, the sundial should be laid out as shown in the first diagram and if it is north, the second diagram should be used. We can easily become disoriented in a survival situation and at first, we might not know if the direction of the noon sun is north or south. However, if we remember that the Sun rises in the East and sets in the west, we can easily align ourselves with north and south. Accuracy. Because, in a survival situation, we may not be sure of our latitude and because of the difficulty of calculating and measuring angles, we must appreciate that a sundial such as described above will not be entirely accurate. However, trials have indicated that an accuracy of ± 15 minutes can be expected and in a scenario such as the one described above, this is considered to be acceptable. On 5th. April, the declination will be 5.1o north and so the Sun will be directly overhead at noon at latitude 5.1o north. In this situation of course, there will be no shadow from the stick and so it will not be possible to mark the north/south line. However, at latitudes close to the Equator, there may be another way of making the sundial. We know that within a few degrees of the Equator, the Sun rises at 06.00 and sets at 18.00 to within a few minutes of accuracy. So, marking the stick’s shadow at sunrise and then marking out the hourly increments from there, may enable us to solve the problem. The object used to cast the shadow (in this case, a stick) is known as a gnomon. The angle between dial and gnomon is equal to latitude of observer. Therefore, at 50o.61 north, the angle between the ground and the gnomon = 50o.61. North/South Movement of the Sun. This entry was posted in Uncategorized and tagged astro navigation, astronomy, celestial navigation, Sundial, survival, survival - navigation, Time. Bookmark the permalink.